3 Bedroom For Sale in Nottingham for Asking Price £360,000. This fantastic Edwardian three bedroom semi-detached home is perfect for a families looking for fantastic local schools and amenities. Benefitting from an open plan living space comprised of a reception room to the front with bay window, spacious and modern kitchen-diner to the rear with French doors leading to rear garden, large entrance hall and under stairs cupboard space. Upstairs the property benefits from three bedrooms and beautiful bathroom suite. The property is fully UPVC double glazed throughout and has a gas central heating system fitted. Outside the property offers a large driveway for multiple cars and landscaped rear garden. 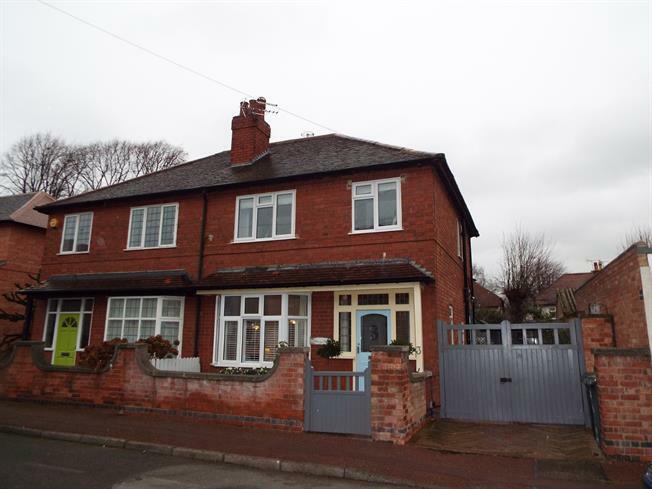 This property is a must view, call Bairstow eves, Beeston on 0115 9431072. Front door, double glazed windows to front and side. Radiator. Double glazed UPVC bay window facing the front. Radiator, laminate flooring. UPVC French double glazed door, opening onto the garden. Double glazed UPVC window. Radiator and wood burner, laminate flooring. Wood work surface, built-in units, double sink. Single bedroom; double glazed UPVC window. Radiator. Double bedroom; double glazed UPVC window. Radiator. Double aspect double glazed UPVC windows with frosted glass. Touch flush, corner bath, shower over bath and power shower, wall-mounted sink.